I have for years ignorantly thought if hiking were allowed in an area then hunting would not be allowed. There are many conservation areas on the south shore that do not allow hunting, but there are state parks and wildlife management areas and several conservation areas where the two co-exist. 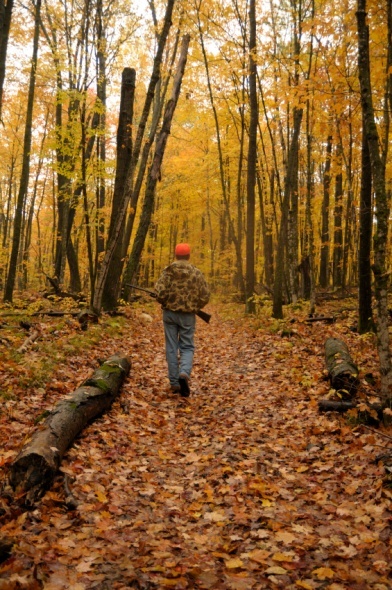 Keeping yourself safe during hunting season on the south shore trails includes knowing what areas allow or prohibit hunting and knowing the law as well. This helps make your "education" on the matter comprehensive!! Gun controls at the very rudimentary level require one to carry an firearms identification card (FID). This card allows the hunter to carry low capacity rifles and shot guns. The holder of this card must be at least 15 years old. To carry high capacity rifles, shot guns and all handguns one must have a License to Carry. Handguns are legal in some areas for hunting, but are prohibited for most usual game hunted here on the South Shore. Those hunters aged 12-14 years old do not need a license, but need to be accompanied by some one who is licensed. Guns can only be carried while hunting, otherwise need to be unloaded and cased. Large capacity rifles additionally need to be secured. A basic law of hunting is carrying a license to do so. The division of fisheries and wildlife set the seasons. The department of fish and game supervise the licensing. There is a Wildlands Conservation Fee stamp that must be purchased first before obtaining a hunting license. If you are a resident of Mass. you pay that only once a year. If it is a non-resident license being purchased it must be payed with every license obtained. A hunting license is required for anyone 15 years and older. Hunters must have proof that they had a license issued prior to the year 2007, otherwise they must have a certificate of completion of a Basic Hunter Education course. Licenses must be carried by the hunter and shown on demand by either an law or game officer or landowner. Possession or discharging of a firearm 500 feet from any dwelling or building unless authorized by its owner. Hunting is prohibited on Sunday. At least one day you can let your guard down when hunting season hiking! No loaded firearms on any motor vehicles such as ATVs or snowmobiles, air craft or boats except stated in the Migratory Game Bird Hunting Regulations. During deer hunting season hunters may only hunt deer with antlers. this permit appears to be by lottery. No artificial lights for hunting any bird or mammal except raccoon and opossum. Intoxication and drugs: no person under the influence of intoxicating liquor or drugs shall hunt, target shoot, carry a firearm, bow and arrow, or other weapon. No machine guns, fully-automatic firearms, any tracer or incendiary ammunition for hunting. Choke traps, leg hold traps, or nets for taking any bird or mammal. Electronic calls for hunting migratory game birds, wild turkey, or deer. This does not apply to the hunting of crows. Ferreting: it is unlawful to hunt with a ferret. Firearms other than shotguns and bows and arrows are prohibited on WMAs stocked with pheasant or quail during the pheasant and quail season. Hunting on posted land without permission. Removal of any mammal from walls, or holes in trees, ground, or logs. Swivel or pivot guns for hunting any bird. Taking nests, destroying, or disturbing eggs or nests of birds protected by law. All guns are prohibited during any archery season. During Archery season poison arrows, explosive tips and mechanically discharged arrows are prohibited. No person shall hunt during the pheasant or quail season on public shooting grounds or WMAs where pheasant or quail are stocked without wearing a “hunter orange” cap or hat except while night-hunting for raccoons or opossums, or while hunting waterfowl from a blind or boat. During the period when it is legal to hunt deer with a shotgun, all hunters, except waterfowl hunters hunting within a blind or from a boat, must wear, in a conspicuous manner on chest, back, and head, a minimum of 500 square inches of “hunter orange” clothing or material. During the muzzleloader season, all deer hunters must comply with the 500 sq. inch hunter orange requirement. If you are hiking during the fall when hunting is in full swing, then wearing a hat or some article of clothing including orange blaze is a hunting season hiking safety must! May be trained at any time (except during the shotgun season on deer) provided that only pistols or revolvers and blank cartridges are used or possessed. No sporting or hunting license is necessary. 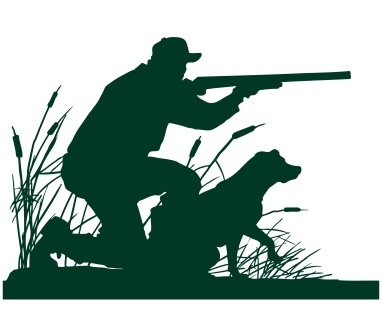 During the shotgun deer season, dogs may be used for waterfowl hunting on coastal waters only. Hunting bear or bobcat with dogs, or training dogs on those species, is prohibited. Most likely you won't find either of these on the South Shore unless they wandered away from a zoo! Must have written permission of the landowner (on either public or private lands) to construct or use any tree stand which is fastened to a tree by nails, bolts, wire, or other fasteners that intrude through the bark into the wood of the tree, or that is fastened or erected in any manner and is emplaced for a period exceeding 30 days. This includes lock-on tree stands. During my hikes in many areas I have found tree stands that make me wonder if they are legal or did I wander off the conservation property? It is illegal to hunt hawks, owls, eagles or moose in Massachusetts. Also any animal not covered by a season. No person shall possess any alcoholic beverage except under permit, or dump or discard any can, bottle, or rubbish. No person shall remove vegetation, soil, or stones from any WMA except under permit. No person shall use excessive speed in driving a vehicle. No person, unless under permit, shall drive or possess any vehicle except on roads or trails maintained for public vehicular traffic. No person shall deface or tamper with any sign, building, or equipment. No person shall build or maintain a fire without written permission from the Director of the DFW or his designee. No person shall camp within any WMA without written permission from the Director or his designee. No person shall engage in target practice without written permission from the Director or his designee. No person shall use any means other than shotgun or bow and arrow during the pheasant and quail season on areas stocked with pheasant or quail except for hunting raccoons and opossums between 9pm and 3am, or except for the shooting of captured fur-bearing mammals by a licensed trapper. No person shall hunt before sunrise or after sunset on any WMA where pheasant or quail are stocked during the open season on pheasant or quail, except for the hunting of raccoons and opossums between 9pm and 3am. No person shall hunt during the pheasant or quail season on WMAs where pheasant or quail are stocked without wearing a ”hunter orange“ cap or hat except while night hunting for raccoons or opossums or while hunting waterfowl from within a blind or boat. No person, except under permit, shall dig or disturb any artifact or archaeological remains. Some of these laws and prohibitions were directly quoted from the Mass. 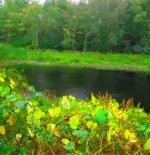 Division of Fish and Wildlife and from the mass.gov energy and environmental pages Department of Fish and Game hunting, fishing and trapping season information page. The information on this page is not a comprehensive list of the laws governing hunting. It is a selection of laws most related to hunting season hiking. Visit these pages above for more information!